We’re wondering what happened to the sun. Honestly, Minnesota is usually bright and sunny, even in the winter. Lately, not so much. Today is warmer, in the low thirties, but it’s very dark and cloudy, spitting snow. Again. Son, Bill, came up to hunt Saturday afternoon and although he didn’t bag a buck, he did help Will set up our new fridge. Boy, was I excited as they got it moved into its final position and hooked up the LP and 12 volt wires, running downstairs to our old battery bank that still works but is just not enough to power the whole house’s needs. By the time Bill left Sunday evening, the freezer had gotten frost on the back. While the guys were working on the fridge, I canned up 10 pints of small rutabagas. They do store well, but I always like to can up some anyway just so we are sure we have some later on. Once canned, they never get wrinkled and soft! 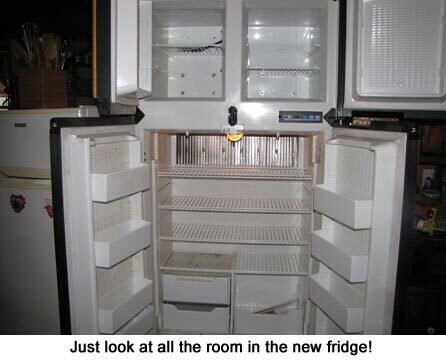 Unfortunately, this morning I opened the doors to find the refrigerator warm. No flame to the burner and the LED lights were flashing “no-co.” (We still don’t know what that means!) I texted Bill, who is an RV technician licensed in LP appliances, and he texted Will back how to re-start it. So he did and so far — cross your fingers and say a few prayers — it’s still working. I was disappointed but do know that some “free” things require a little work to get them up and running permanently. In that vein, Will finally got the clutch apart for the Mule RTV so he could adjust it. He’s been working on that for months now, even taking it to our neighbor’s shop to use a press. But finally, as he was tinkering with it in his easy chair, it opened! So it looks like we just may have the Mule operational before too much longer. Thanks for the encouragement and kindness! 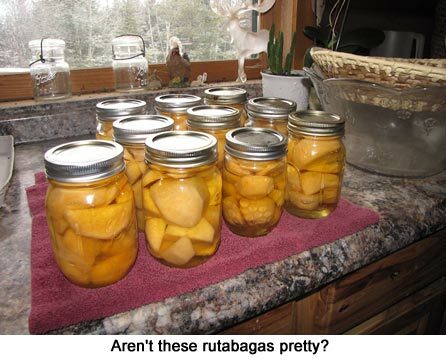 I use canned rutabagas in about anything from pasties (the pie variety, not what strippers wear!! ), stews and meat pies. I also mash them and fry them. Love those rutabagas! No, they soften a bit but don’t get mushy. Also, can I speak for the rest of your readers here and say how thankful we are for you and yours? While we don’t yet can food here, we someday hope to, and I know you’ll be my go-to reference. My wife and I wish you all a wonderful Thanksgiving. We got your 3 books on homesteading and canning cook books last week and are loving them! I’ve been following your blog and BWH articles for years, and just got the wife introduced to more self-reliant living. Big Thanksgiving Thanks for the inspiration! What kinds of things would you use your canned rutabagas for? Are they quite mushy when canned? I actually canned some two years ago but haven’t opened them yet. I thought about adding them to stew or soup. Would that work? That refrigerator is just magnificent! Hope it works perfectly from here on.